Shipping furniture to Spain from UK towns and cities can be a fairly simply process entailing not much more than ensuring you contact a removals company with plenty of time to spare and agreeing a price. They will do everything else, even the packing if that is what has been agreed. 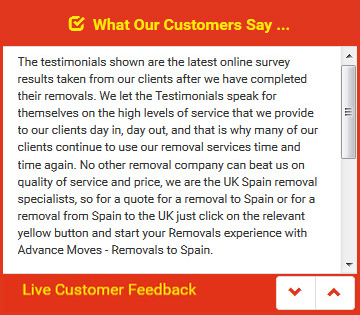 It is important, however, to make sure that you read all of the small print on your quotation from the company you choose for your removals to Spain. They may have included some requirements that, unless you look closely, you might not have noticed in time. One such requirement could be that all flat pack furniture � or anything else that can be taken apart � is disassembled before they arrive. If you have to spend time taking furniture apart instead of organising moving furniture to Spain, you could be seriously delayed. Something else that you may be required to do under the terms of your international removals contract is to disconnect and defrost your freezer. Again, if this is not done in advance you may even have to pay to store the freezer rather than take it with you, as it cannot be transported if it is not properly defrosted. You should also label your furniture and ensure that your name and reference number are included. This can be a sticker on the back of large items, or a tag tied to smaller ones; it doesn�t matter as long as the details are clear and easy to read. This is particularly important if you are taking advantage of a part load deal. Shipping furniture to Spain from UK areas is what Advance Moves does every day. Our excellent prices and superb customer service makes us the best. Why not work out a quick quote from our website (http://www.advancemoves.com/) or contact us on 0871 218 0612 or email info@advancesmoves.com? We do the hard work for you.